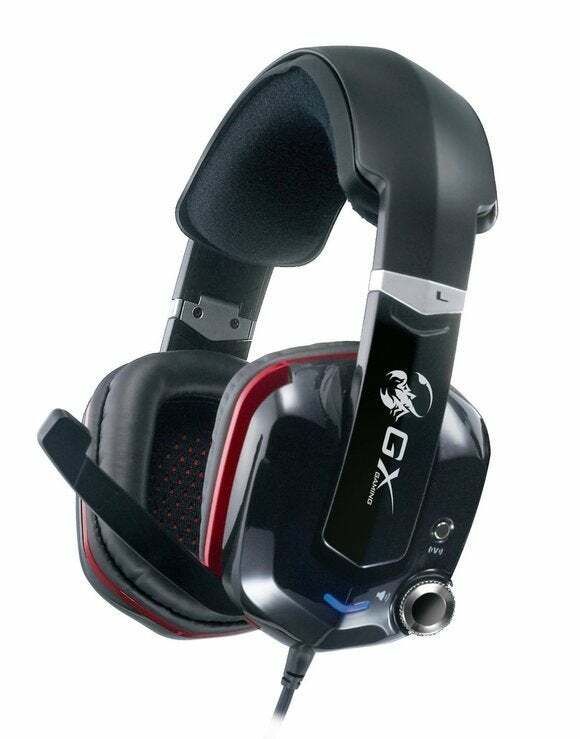 The GX Gaming Cavimanus is like the headset version of a concept car. Think of every weird, whiz-bang feature you'd want from a headset, and there's a solid chance it shows up on the Cavimanus. Oh, it's nothing to look at. The Cavimanus is actually a bit boxy—a far cry from the sleek designs we see out of Astro or SteelSeries—and is decked out in glossy (read: cheap-looking) red and black plastic. This set of cans definitely won't win any beauty pageants. It's an unfair first impression, though. Underneath that red and black plastic, for instance, is a durable metal frame that gives this headset a decent heft. 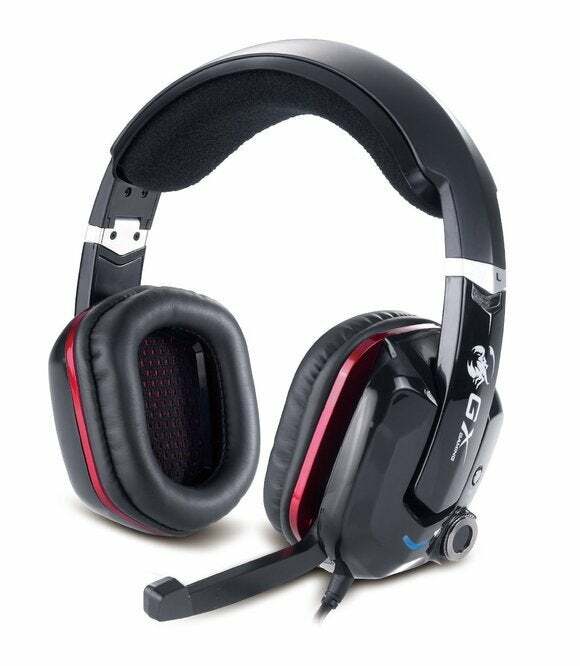 The headset flexes side-to-side a bit more than I'm comfortable with, and it doesn't come close to the build quality of the HyperX Cloud. Among the budget headsets we've reviewed, however, this is a perfectly capable device belied by its outward appearance. There's a sizable volume knob built into the left earpiece. It's not all that pretty, but it's functional. This is the easiest built-in volume control I've ever used, with the exception of the Siberia Elite's enormous earpiece-encompassing knob. It's simple to find, it's simple to adjust. That's more than can be said of most headsets, whether using built-in controls or in-line controls. Wearing the Cavimanus is a bit strange. The headset doesn't seal against the head as much as it just hangs. 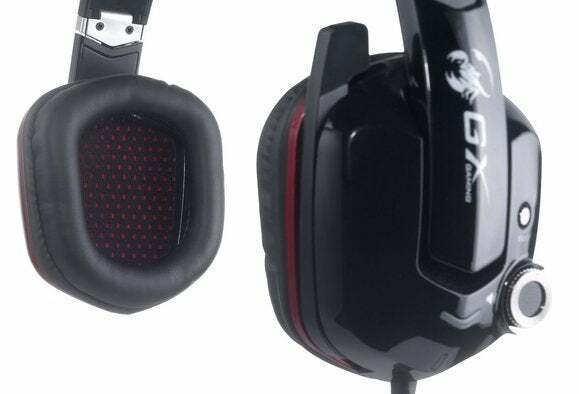 While this makes up for the relatively thin amount of padding on the earpieces, it also means that leaning forward or back causes the headset to shift around. The sound of the Cavimanus leans heavily on the bass. Heavily. Out of the box, this is one of the most bass-heavy sets I've ever used. The highs and mids still cut through decently, but there's an enormous bass presence behind it all that I'd argue is a bit too much, especially if you're ever going to try and listen to music or watch TV on these things. I think the Cavimanus was designed with bass in mind, though. Remember how I said this thing is like a concept car? Well let's get into the really weird concepts. Above that enormous volume knob is a solitary button with a "V" next to it. It turns out the Cavimanus is built to vibrate like an overloud subwoofer. Yes, it vibrates on your head. It's not incredibly powerful—I'd liken it to the kick of a small 2.1 set of computer speakers—but the fact remains the Cavimanus shakes against your head whenever there's a powerful bass note. I've no doubt this is a divisive feature. Me? I thought it was a nice bit of haptic feedback during explosions/gunfights/what have you. Playing devil's advocate, though, I could see how the vibration might get really annoying after a while. You can disable it, but do so while playing a game and you'll notice that the bass feels a bit lifeless afterward. Returning to the idea of the Cavimanus as a powerful device undercut by its appearance, the same theme actually extends to the software that comes with it. The Cavimanus cord (plain rubber, by the way) terminates in a USB connection. You can either install software for sound adjustments off an included disc or download it, if, like me, you've moved on from optical media. Wow: The software is ugly. I cannot stress this enough, because at best it looks like you're trying to adjust the speakers in Windows XP. There is serious power here, though. You've got your generic raft of EQ sliders, of course, but that's just the start. Want to pitch shift whatever's coming in to the Cavimanus? You can do that. Want to clumsily excise the vocal parts from a song? You can do that. And did I mention this is a full 7.1 surround-enabled headset? And unlike Corsair's H1500, the Cavimanus gives you all sorts of adjustments to take advantage of its surround sound. You can, for instance, spoof different-sized environments for the audio (Shower, Arena, Underwater, Cathedral, et cetera) or shift where the virtual speakers are placed in the "room." The microphone also gets a host of customizations, including a virtual +48V switch if you think the microphone isn't loud enough. And while the microphone doesn't bend, it does automatically mute when flipped up out of the way, which is potentially my favorite non-essential headset feature. The Cavimanus is weird. It's not very pretty, nor does it have the best sound on the market. Still, it's such a unique device in many ways (not least of all because of the vibration) that I could see it garnering interest. And that's not a bad thing. If you're willing to spend an hour tweaking its sound, the Cavimanus becomes an even more attractive value proposition—it's a great 7.1 headset at this price point. In fact, I'd say this has the potential to be the best 7.1 headset at this price point, but not everyone's going to have the patience to tweak and tweak and tweak.